Apologies for any inconvenience caused by the recent website downtime. Unfortunately this was due to circumstances outside of our control. Admin Team. Thursday 12th April. Just got home from the Ipswich Gang Show. What a show it was! The energy of the cast, both young and old, was fantastic. I saw lots of familiar faces and a few new ones this year. The tribute to Roy Goody and “I Wish I May” were show-stoppers. I loved the 80s selection and the youngsters in the Circus scene were just great. If you were there at their first night I am sure you won’t forget the Big Spender scene in a hurry. All in all, a really fabulous show and it gets better every year. I loved it. Saturday was the last day of March! Where has the time gone? On checking my diary I can see how it was spent, but that doesn't make it any easier to accept the march of time. The Scout and Guiding organisations in Martlesham joined together with helpers and volunteers for a tree and bulb planting ceremony to celebrate the Queen's Diamond Jubilee. The following article appeared in the East Anglian Daily Times 6th March 2012. 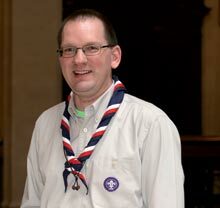 Tim Kidd and the HQ Team are looking forward to meeting around 40 Group Scout Leaders from Suffolk on Sunday 25th March to discuss the services currently provided by Scout Headquarters and to find out what works, what does not and also what services would provide additional support for a Group Scout Leader. See Calendar for event details. Suffolk High Sheriff's "Volunteer of the Year"
Congratulations to Brian Childs, GSL at 1st Otley, for winning the Suffolk High Sheriff's Volunteer of the Year 2012 award. Brian was presented with a cup and certificate at Bury St Edmunds Cathedral on March 8th for his hard work and enthusiasm for Scouting, Otley Parish Council and Otley Baptist Chapel. He was interviewed on the Lesley Dolphin programme on BBC Radio Suffolk on 9th Mar 2012. It's taken a few months to get sorted, but we are pleased to say that our template for Suffolk Scout groups to use is now finished! Take a look at our demo site here (http://group.suffolkscouts.org.uk) and get your group on the web! Win a 7 day cruise for two people and help Bradfield Park Campsite!